It’s the most famous matchplay tournament in the sport and the winners carry bragging rights for years. The United States have been the dominant side, winning 25 of the 40 contests against their opponents from across the Atlantic, but in the past decade it has been the men from Europe who have turned the screws. Europe have won a staggering eight of the last 10 times the Ryder Cup has been played and in 2014 at Gleneagles in Scotland they romped away to win by a clear five points, 16 1/2 to 11 1/2. The USA last won in 2008 at Valhalla where the Paul Azinger-led hosts snapped a three-event losing streak to give the impression that the ride had turned. The defeat was Europe’s worst performance since Walton Heath in 1981, when they were thrashed 18½-9½. Two years later the trophy was back on European soil when Graeme McDowell held his nerve in the final singles match as Europe clung on to their overnight lead to beat United States 14½-13½ to regain the Cup at Celtic Manor. Then, in 2012, a comeback for the ages at Medinah as the USA required only four-and-a-half points from the final 12 on offer, but the Europeans secured eight and a half to clinch a 14½-13½ win. And then in 2014 Europe maintained their grip with a crushing five-point victory as rookie Jamie Donaldson had the honour of securing the decisive point. 2 Golfers who played five or more career matches without losing. Jimmy Demerit won six matches and Bobby Nichols five, winning four and halving one. 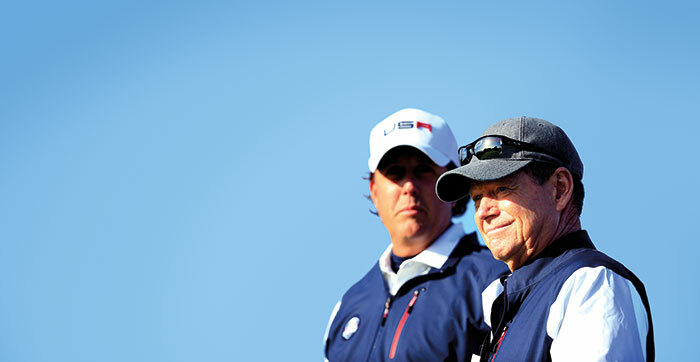 2 The number of fathers and sons who have represented their country in the Ryder Cup. Percy Alliss played from 1929-1937 and Peter Alliss competed in Ryder Cups from 1953 to 1969. The other combination was Antonio Garrido (1979) and Ignacio Garrido (1997). 4 Golfers who who played five or more career matches without winning. Alf Padgham was 0-7, Tom Halliburton 0-6, John Panton 0-5 (all for Europe) and Rickie Fowler has played eight matches without asking up a win, losing three and halving five. 5 There have been five sets of brothers to have played in the Ryder Cup. The most recent was Edoardo Molinari and Francesco Molinari in 2010. 6 The number of holes-in-one produced in Ryder Cup tournaments. They were by Peter Butler (1973), Nick Faldo (1993), Constantino Rocca (1995), Howard Clark (1995), Paul Casey (2006) and Scott Verplank (2006). 8 The most number of matches halved, shared by Tony Jacklin and Gene Littler. 11 Nick Faldo has made the most Ryder Cup appearances, followed on 10 by Phil Mickelson, Bernhard Langer and Christy O’Connor Snr. 19 The age of the youngest player to appear in the Ryder Cup, Spain’s Sergio Garcia being 19 years 8 months 15 days when he made his debut in 1999. 20 The lowest winning percentage of the man to have played at least 15 matches. Europe’s Harry Weetman and George Will only won two of their 15 matches, both losing 11 and halving two. 21 This is the record you don’t want to be associated with. Neil Coles and Christy O’Connor Snr both lost 21 matches, followed by Jim Furyk on 20. 23 The most matches one by a player, with Nick Faldo holding that record. Arnold Palmer won 22 matches, Bernard Langer 21 and Seve Ballesteros, Colin Montgomery, Billy Casper and Lanny Wadkins all won 20. 25 Over the years the US have had the upper hand, winning 25 of the 40 contested, with Great Britain/Great Britain and Ireland/Europe taking 13 and two ties. 40 Times the Ryder Cup has been played, with the first one in 1927, in which the hosts beat Great Britain 9 1/2 2 ½. 46 Most Ryder Cup matches played, by Nick Faldo. Bernhard Langer has played 42, with Lee Westwood and Phil Mickelson on 41. 51 The age of the oldest player to appear in the Ryder Cup. American Raymond Floyd was 51 years and 20 days when he competed in the 1993 tournament. 72 The highest winning percentage of the man to have played at least 15 matches. They called Ian Poulter ‘the Postman’ because he said ‘he always delivers’ and won 12 of his 18 matches, losing four and halving two. Next best was Arnold Palmer, Tom Watson and Luke Donald (all 70%).